New Albany is a delightful Indiana city that offers its residents waterfront entertainment, a historic downtown, a thriving parks department, great residential neighborhoods, and booming business districts. To help keep your New Albany home or business free of the many pests that also live in New Albany, turn to a company that you can trust, turn to Action Pest Control. At Action Pest Control we can provide termite control, mosquito control, ant control, rodent control, residential pest control, commercial pest control and more to protect New Albany properties from pests! To learn more about keeping pests away from your home or business, contact Action Pest Control today. Essential - This is our basic service and provides customers with exterior pest defense services along with cobweb removal. Advanced - The Advanced program provides customers with both exterior pest defense and interior pest treatments. Complete – The Complete pest control program provides both exterior and interior pest treatments, but it also includes an annual attic inspection, termite monitoring services, and a termite inspection. This program protects your home from common household pests and wood-destroying termites. Premier - The Premier program is our most comprehensive and most popular service; it offers the most complete protection for your home. It provides exterior and interior pest treatments, an annual attic inspection, and superior protection against termites through our termite monitoring services, a termite inspection, a termite warranty, and termite treatment. 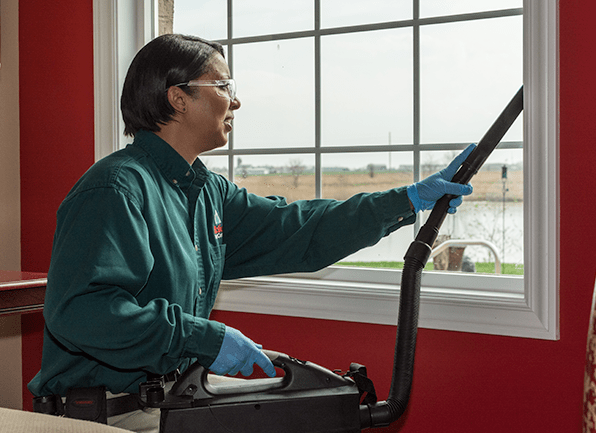 To learn more about any of the above residential pest control services and to discover which is the right fit for your New Albany home, give us a call today. Know what black widow spiders look like and if you ever spot them on your property or in your home make sure to stay away from them and call for immediate professional help. Remove piles of sticks, brush, construction materials, and wood from your property that could act as hiding spots for black widow spiders. Keep storage areas like garages, sheds, and basements organized and free of clutter. When working outside or in storage areas always wear work gloves. Always shake out clothing and shoes to dislodge hiding spiders before putting them on; pull down sheets and covers and inspect your bed before getting inside of it. If you are experiencing problems with black widow spiders on your New Albany property or in your home the professionals at Action Pest Control can provide the services needed to get rid of these dangerous spiders and to keep them away from your family and pets. To learn more about our how our home pest control services can protect your home and family from black widow spiders, contact us today. Make sure that gutters are in good working order to direct water away from the outside of your home. Make sure that gutters are not allowing water to overflow and enter into your home to cause water damage in attics spaces and behind walls. Install dehumidifiers in basements; make sure that crawl spaces are properly ventilated in order to reduce moisture levels in your home. Fix any leaky outdoor or indoor faucets, fixtures, and pipes. Remove any water damaged wood from your property. Seal any cracks or crevices found in your home’s foundation to prevent termites from accidentally finding their way into your New Albany home. Contact Action Pest Control to put into place a termite prevention and control program. To protect your New Albany, Indiana property from termites put into place a comprehensive termite solution from Action. Our five-step termite control system includes a comprehensive inspection and the treatment of the infestation using Termidor®. We then follow-up with a three-month termite elimination inspection and an annual termite inspection to make sure that these damaging pests do not return. To learn more about our termite services, including our money-back guarantee and damage warranty, give us a call today!